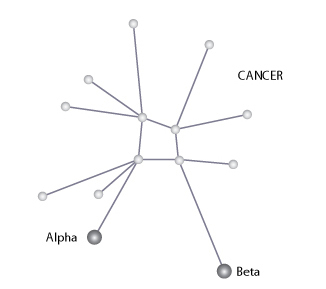 The story behind the name: Cancer, the crab, is one of the original 13 constellations of the Zodiac. 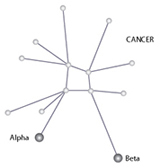 Despite being a relatively dim constellation, the story behind Cancer is one of adventure. 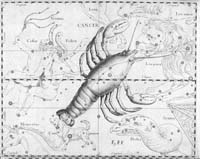 During one of Hercules's 12 labors, where he was battling against a Hydra, the goddess Hera sent a crab named Cancer to distract the hero. The crab was able to get his claws around Hercules's toes, but failed to do any more damage as Cancer was crushed shortly afterwards. 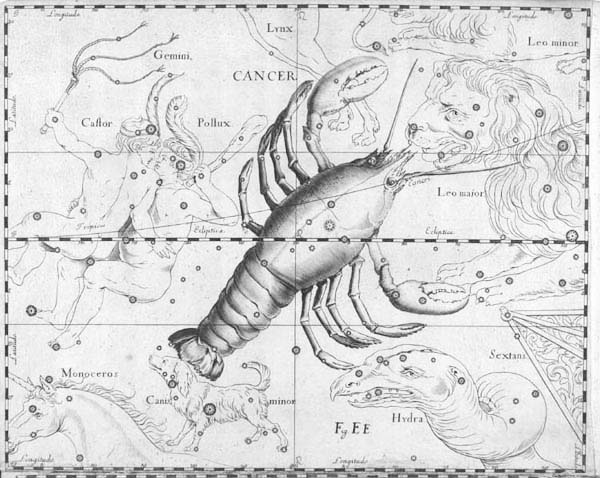 Hera felt pity for the small creature that died for her wishes and gave Cancer a place among the stars in the Zodiacal constellation. The constellation contains an important star cluster known as the 'beehive'. When observed with the naked eye, it appears as a fuzzy region in the sky. But even through a small optical telescope, its multitude of stars looks like a swarm of bees. The star cluster is known as M44 or NGC 2632. Another interesting object that is found in Cancer is RX J086.3+1527, which is suspected to give off strong gravitational waves.